Practice sentence structure and parts of speech in this game with over 500 playing cards with a variety of funny words. A game designed to help children with forming structured and accurate sentences. Comes with 540 playing cards that each have a different word on them. Each player gets ten cards. There are enough cards so there are no repeats and the game is different every time. A pack of 540 pentagon shaped cards with random words and names. Each player gets ten cards and has to make a sentence with them. Works on creating sentences, sentence structure, and parts of speech. The game can be played with two people, but is recommended for three or more. Each players gets ten cards, and each card has a word or name on it. Each player has to create a sentence with their cards. Then, one by one, each person shares their sentence with the rest of the players, and the other players vote if the sentence makes sense. If they vote no, then the player presenting their sentence can defend the sentence they created and why it makes sense. The winner is the player whose sentence makes the most sense. 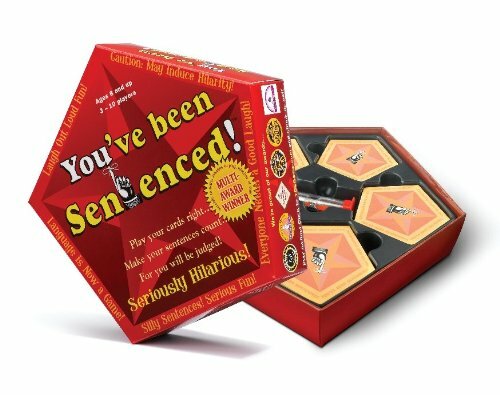 The “You’ve Been Sentenced” board game is a game that challenges players to make well-structured sentences with over 500 crazy and funny words and names. Reviews said that because there are 540 pentagon-shaped cards, there are usually no repeats of words, which makes the game new and different each time it is played. The minimum age recommended to play this age is eight years old, because there is a lot of reading and thinking involved. Users have said the reading is pretty basic, so second and third graders will have no trouble playing the game. The game usually takes around thirty five to forty minutes, but it can be shorter or longer depending on the number of players. Some users have said it can be as quick as ten minutes and as long as a couple hours. The game also includes different parts of speech so children can practice forming sentences with adverbs, adjectives, nouns, verbs, and more. A few reviewers mentioned that sometimes the game can be kind of confusing, and that kids can get angry and frustrated when other players defend their sentence and it doesn’t make sense. There are 540 cards with silly words and names on them. There is a timer made of plastic that can be used so that everyone has the same amount of time to make their sentence. There were concerns from several users that the words on the cards were so silly and odd that it was really hard to make a sentence that made sense. Some said there were also names of “famous” people on the cards to use in the sentences, but there were a lot of unknown people and there was not a description of who that person was. Just deal 10 cards each and have some zany laugh-out-loud Fun making sentences. With the deck of 540 pentago-shaped cards with over 2500 words plus Wild Cards there are billions of possible combinations. You will probably never see the same sentence twice in a lifetime. English can be a very Funny language.